Do you like waffles?! I love waffles! I used to eat the Eggo Waffles nearly every day! And for Christmas I received a waffle iron of my own, so not too long ago, we decided we'd give it a go. One of our favorite things to have for dinner is breakfast. 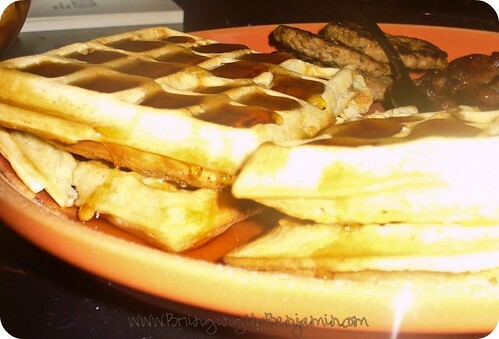 So easy and inexpensive, and who doesn't love stuff drenched in syrup?! Yeah, that's what I thought! Of course, Benjamin can't eat regular waffles as he is allergic to eggs. We like to make things that he can eat with us, since we all eat at the same time and Benjamin likes to do that little number where he reaches and oops! His hand just so happens to land in your plate, and he may as well go ahead and grab what he's touched. It always reminds me of the typical guy in the movie theater with his girlfriend, the yawn and stretch and oops! My arm's around your shoulders! Anyway. I tried to do waffles from my eggless baking book, but that didn't end so pretty. Instead, I just took a regular waffle recipe and switched it up a bit so Benjamin could eat it. 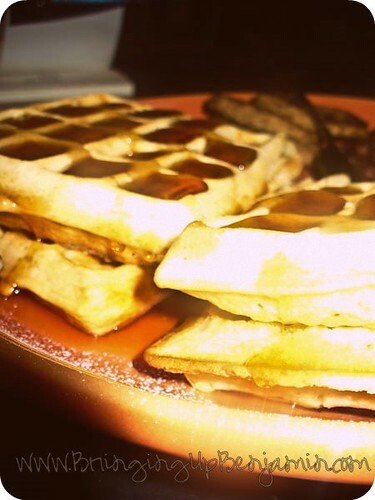 We can call these "Benjamin's Waffles". 2. Pour it onto your waffle grids. I used I think a cup of batter for each grid. Don't forget to use Pam on there, or your waffles may stick and be a real pain to get up. 3. Close the lid, and wait. I suppose it depends on what sort of waffle iron you use, but ours were done with the steam stopped coming out of the sides. 6. Serve warm with butter and syrup if you'd like! You can even toss some fruit on there! Of course, Ben's did not have syrup or anything on it. He ate his plain. But he still liked it! They tasted sort of like vanilla wafers. Three Cheers for Cheerwine Cake! Perfect Chocolate Cupcakes, without the eggs!